Infamy or Praise: How is open software different from the Mos Eisley cantina? 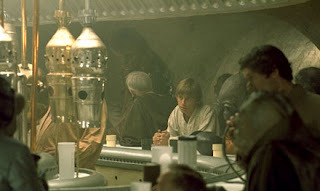 How is open software different from the Mos Eisley cantina? Well, technically speaking, there are probably many differences between the open software movement and the cantina at the Mos Eisley spaceport in Star Wars, but I'm thinking of one difference in particular today -- unlike the cantina, the open software movement is particularly welcoming to droids. ASL, which is widely used in the open-source software community and has been approved by the Open Source Initiative, is a permissive license that is conducive to commercial development and proprietary redistribution. Code that is distributed under the ASL and other permissive licenses can be integrated into closed-source proprietary products and redistributed under a broad variety of other terms. Unlike permissive open-source licenses, "copyleft" licenses (such as the GPL) generally impose restrictions on redistribution of code in order to ensure that modifications and derivatives are kept open and distributed under similar terms. Permissive licenses like the ASL and BSD license are preferred by many companies because such licenses make it possible to use open-source software code without having to turn proprietary enhancements back over to the open source software community. These licenses encourage commercial adoption of open-source software because they make it possible for companies to profit from investing in enhancements made to existing open-source software solutions. That potential for proprietary investment on top of an open stack is most likely what inspired Google to adopt the Apache Software License for its mobile platform. Availability of Android under the ASL will ensure that a broader number of companies will be able to adopt the platform and build on top of it without having to expose the inner workings of proprietary technologies that give them a competitive advantage. Although using a permissive license like ASL is the best way to build support for the Android platform, critics argue that Google has sacrificed an opportunity to encourage greater openness in the broader mobile software space. If Android was distributed under the GPLv2, companies building on top of the platform would have to share their enhancements, which could theoretically lead to widespread sharing of code and a more rapid acceleration of mobile software development. The counterargument is that distributing Android under a copyleft license could potentially limit the evolution of the mobile software ecosystem by discouraging commercial development on top of the platform. Proprietary mobile software development companies that integrate Android into their technologies would have to dramatically change their business models if they aren't given the ability to keep their enhancements proprietary. Ultimately, the decision to use the ASL is sensible. Although it would be beneficial to all if Google were to use Android licensing to further open the market, that likely would have stifled adoption of the platform by handset makers. When it comes right down to it, the handset makers are the developers who are most significantly affected by the Android license, since they are the primary distributors of mobile phone platforms. The ASL will allow individual handset makers to develop proprietary customizations for the platform as needed to accommodate the unique technologies in their individual products. All in all, what's important in this announcement is not which open source license has been chosen by Google and its Open Handset Alliance; what's important is that their decision to embrace open software has provided a boost the movement. This is a good thing regardless whether you personally use open source products; the presence of open software in the marketplace drives innovation and variety in both technological terms and legal ones and that benefits us all. 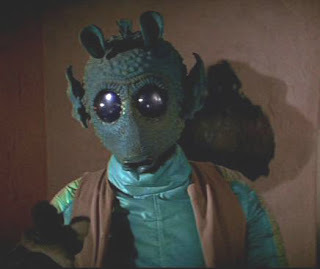 After all, there's at least one more difference between open software movement and the Mos Eisley cantina -- there's a lot less "greedo" in open software.